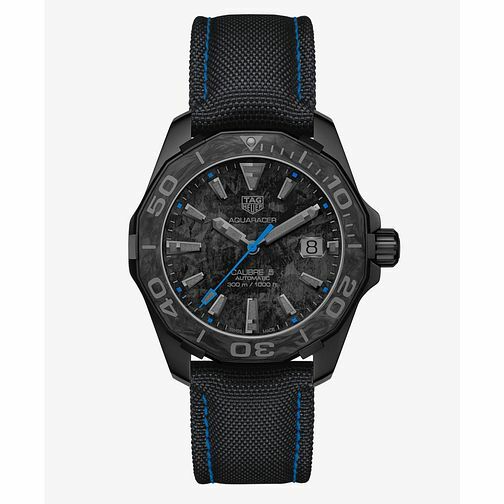 With a distinct look and feel, this Aquaracer Carbon Series watch from TAG Heuer features the same kind of dedication to precision you would expect, updated with a more distinct design. The black fabric strap matches off with the radial-texture dial giving it a much stronger character, with blue stitching co-ordinating with blue seconds hand and subtle hour marker accents upon the dial. Aswell as boasting an impressive water resistance of up to 300m, other features include a tachymeter bezel, PVD casing, and a date aperture at the 3-o-clock position, for a technical showcase that is both precise and unapologetically avant-garde.